who's up for another Brantley surprise today? this one's pretty sweet. 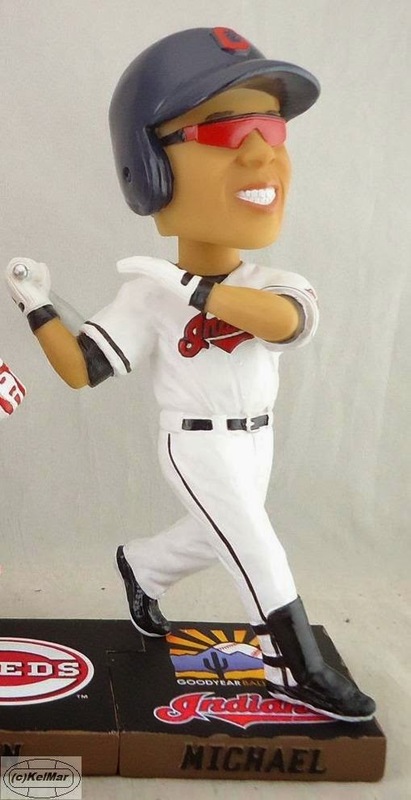 so back on November 21, 2014, the Indians' promotional schedule for spring training 2015 came out and it included a Michael Brantley Silver Slugger Bobblehead giveaway on March 7. and if you recall, i was extremely upset about not being able to get this bobble. i would give just about anything to add this to my Brantley collection. why the Indians opted not to do this giveaway during the upcoming season, i may never know. i believe this would have been better celebrated at Progressive Field, and Michael certainly deserves as much recognition for his Silver Slugger Award as he can get. if you are also in the same boat as i am, wanting this bobble but not having the ability to go to spring training in Arizona to acquire it, i may be able to offer a little shred of hope. there are no guarantees but, at some point, it might be for sale, potentially at one of those vendor areas outside Progressive Field (across from Gate C and across the street from the Thirsty Parrot). or it could end up online on a website such as ebay. after all, some "collectors" only collect things so that they can re-sell them. however, all the items that the vendors sell are usually a bit overpriced. and who knows how many bobbleheads will even be available to purchase. remember, only the 1st 1,500 people at the March 7 game will receive this bobble. therefore, there may not be many extras for anyone to sell at a later date.